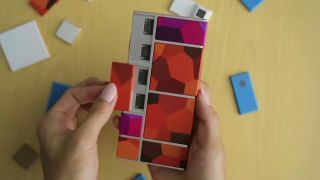 Google's Project Ara, which lets users customize their phones with standalone modules for cameras, processors, storage, batteries, and other components, had originally planned for a launch sometime later this year in Peurto Rico. However, the company took to Twitter last week to confirm that though it was still "busy making stuff", it would no longer launch in the Latin American country and it would have more details for us this week. Thankfully, they've kept their word with a series of new tweets today - though unfortunately, it may disappoint those who were holding out on updating their phone in hopes of getting their hands on a Project Ara handset. The tweets began with the company saying it was looking at a new launch location in the US, but then posted "When? 2016" along with the hashtag #yeswearelate. While a full explanation wasn't given as to why the handset would be delayed, a following tweet did blame it on the number of iterations that will be available, saying it was "more than we thought." So far, that is all the updates Project Ara has provided, and the tweets also don't give us a timeframe of when in 2016 it will be launching. Still, we'll be keeping an eye on their Twitter account to see if it drops any other nuggets of information.